Pirelli launch new tyres with orange sidewalls and more degradation // Pirelli talk of the 2013 tyres, with a new sidewall colour scheme to help stop confusion. 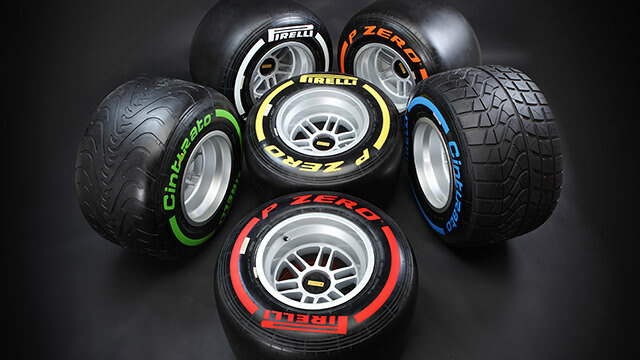 Formula One’s sole tyre supplier Pirelli held their press launch for the 2013 season today, releasing heaps of information about their tyres for the single seater sport, plus many of the other motorsport series’ they provide as well. The most visible change in F1 is the coloured sidewall for the hard compound tyre - for the previous two years it has been silver, which has been hard to distinguish from the white medium compound. For 2013, it has been changed to a vivid orange, which will be impossible to confuse with white. The compounds have all been tweaked as well, or as Pirelii say, they have undergone a revolution. The tyres have “new structures and softer compounds” which are designed to “increase thermal degradation.” Essentially, they want to try and ensure there are at least two pit stops per driver per race, hoping to increase the overtaking and thus, increase the entertainment too. The new tyres will first be seen in action when testing gets underway in two weeks’ time. And talking of testing, Jaime Alguersuari and Lucas di Grassi remain as Pirelli test drivers.